1914 - Cyprus annexed by Britain, after more than 300 years of Ottoman rule. Britain had occupied the island in 1878, although it remained nominally under Ottoman sovereignty. 1925 - Becomes crown colony. 1955 - Greek Cypriots begin guerrilla war against British rule. The guerrilla movement, the National Organisation of Cypriot Combatants (EOKA), wants enosis (unification) with Greece. British authorities arm a paramilitary police force made up of Turkish Cypriots. 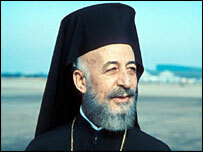 1956 - Archbishop Makarios, head of enosis campaign, deported to the Seychelles. 1959 - Archbishop Makarios returns and is elected president. 1960 - Cyprus gains independence after Greek and Turkish communities reach agreement on a constitution. Treaty of Guarantee gives Britain, Greece and Turkey the right to intervene. Britain retains sovereignty over two military bases. 1963 - Makarios raises Turkish fears by proposing constitutional changes which would abrogate power-sharing arrangements. Inter-communal violence erupts. Turkish side withdraws from power-sharing. 1964 - United Nations peacekeeping force set up. Turkish Cypriots withdraw into defended enclaves. 1974 - Military junta in Greece backs coup against Makarios, who escapes. Within days Turkish troops land in north. Greek Cypriots flee their homes. Coup collapses. Turkish forces occupy third of the island, enforce partition between north and south roughly along the "Green Line" ceasefire line drawn up by UN forces in 1963. Glafcos Clerides, president of the House of Representatives, becomes president until Makarios returns in December. 1975 - Turkish Cypriots establish independent administration, with Rauf Denktash as president. Denktash and Clerides agree population exchange. 1977 - Makarios dies. Succeeded by Spyros Kyprianou. 1980 - UN-sponsored peace talks resume. 1983 - Denktash suspends talks and proclaims Turkish Republic of Northern Cyprus (TRNC). It is recognised only by Turkey. 1985 - No agreement at talks between Denktash and Kyprianou. 1988 - Georgios Vassiliou elected Greek Cypriot president. 1989 - Vassiliou-Denktash talks abandoned. 1992 - Talks resume and collapse again. 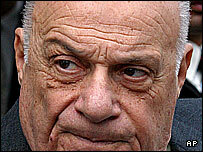 1993 - Glafcos Clerides replaces Vassiliou as president. 1994 - European Court of Justice rules that a list of goods, including fruit and vegetables, are not eligible for preferential treatment when exported by the Turkish Cypriot community directly to the EU. 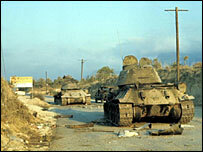 1996 - Increased tension, violence along buffer zone. 1997 - Failure of UN-mediated peace talks between Clerides and Denktash. 1998 - Clerides re-elected to a second term by narrow margin. EU lists Cyprus as potential member. Clerides' government threatens to install Russian-made anti-aircraft missiles. Turkey threatens military action. Clerides decides not to deploy missiles in Cyprus. 2001 June - UN Security Council renews its 36-year mission. Some 2,400 peacekeepers patrol the buffer zone between Greek and Turkish Cypriots. 2001 July - Dozens of police officers are injured as protesters attack a British military base at Akrotiri over plans to build telecommunications masts alleged to pose a health hazard. 2001 November - Turkey says it might annex the north if the Republic of Cyprus joins the EU. It says the move, coming before any reunification settlement, would violate the 1960 treaty. 2002 January - Clerides and Denktash begin UN-sponsored negotiations. Minds are concentrated by EU membership aspirations. 2002 November - UN Secretary General Kofi Annan presents a comprehensive peace plan for Cyprus which envisages a federation with two constituent parts, presided over by a rotating presidency. 2002 December - EU summit in Copenhagen invites Cyprus to join in 2004 provided the two communities agree to UN plan by early spring 2003. Without reunification, only the internationally recognised Greek Cypriot part of the island will gain membership. 2003 February - Tassos Papadopoulos defeats Clerides in presidential elections. 2003 March - UN deadline for agreement on reunification plan passes. Secretary-General Kofi Annan acknowledges that the plan has failed. 2003 April - Turkish and Greek Cypriots cross island's dividing "green line" for first time in 30 years after Turkish Cypriot authorities ease border restrictions. 2004 April - Twin referendums on whether to accept UN reunification plan in last-minute bid to achieve united EU entry. Plan is endorsed by Turkish Cypriots but overwhelmingly rejected by Greek Cypriots. The EU agrees to take steps to end the isolation of the Turkish Cypriot community. 2004 1 May - Cyprus is one of 10 new states to join the EU, but does so as a divided island. 2004 December - Turkey agrees to extend its EU customs union agreement to 10 new member states, including Cyprus. The Turkish prime minister says this does not amount to a formal recognition of Cyprus. 2005 April - Mehmet Ali Talat elected Turkish Cypriot president. 2005 May - Greek Cypriot and UN officials begin exploratory talks on prospects for new diplomatic peace effort. 2005 June - Parliament ratifies proposed EU constitution. 2005 August - Cypriot airliner crashes near Athens, Greece, killing all 121 passengers and crew. It is the island's worst peacetime disaster. 2006 May - Greek Cypriots back ruling coalition in parliamentary elections, endorsing its opposition to reunification efforts. 2006 July - UN-sponsored talks between President Papadopolous and Turkish Cypriot leader Mehmet Ali Talat agree a series of confidence-building measures and contacts between the two communities. 2006 November - EU-Turkey talks on Cyprus break down over Turkey's continued refusal to open its ports to traffic from the Republic of Cyprus. Ankara says the EU should end the isolation of the Turkish Cypriot community before Turkey opens its ports. 2007 February - Turkey denies sending extra warships to the eastern Mediterranean in a row over oil drilling rights off Cyprus. 2007 January-March - Greek and Turkish Cypriots demolish barriers dividing the old city of Nicosia. The moves are seen as paving the way for another official crossing point on what used to be a key commercial thoroughfare. 2008 January - Cyprus adopts the euro. 2008 February - Left-wing leader Demetris Christofias wins presidential elections. Promises to work towards reunification. 2008 March - President Christofias and Turkish Cypriot leader Mehmet Ali Talat agree to start formal talks on reunification. 2008 April - Symbolic Ledra Street crossing between the Turkish and Greek sectors of Nicosia reopened for first time since 1964. 2008 September - Greek and Turkish Cypriot leaders launch intensive negotiations aimed at ending the division of the island. 2009 April - Right-wing nationalist National Unity Party wins parliamentary elections in northern Cyprus, potentially hampering peace talks. Turkish Cypriot leader Mehmet Ali Talat remains in office, but in a weakened position. Reunification talks continue through 2009, with little progress. 2010 January - President Christofias and Turkish Cypriot leader Mehmet Ali Talat resume talks on reunification in downbeat mood, no progress made. 2010 April - Dervis Eroglu, who favours independence, wins the Turkish north's leadership contest, beating pro-unity incumbent Mehmet Ali Talat. 2010 May - Re-unification talks resume with a new hardliner representing the Turkish north. 2011 May - Parliamentary polls. The the main right wing opposition party DISY wins by a narrow margin. 2011 July - Navy chief Andreas Ioannides and 12 others died when people when impounded Iranian containers of explosives blew up at the main naval base and the country's main power plant. The defence minister, military chief and foreign minister resigned over the incident, which officials said occurred after a bush fire ignited the explosives. Credit rating agency Moody's cuts Cyprus's rating by two notches from A2 to BAA1, increasing risk of Cyprus requiring an EU bailout. Power shortages caused by the naval base blast knocking out the country's main power station, plus significant Greek debt, have made financial reform difficult. Fitch cut Cyprus's rating to A- from AA- in May over Greek debt fears. 2011 August - President Christofias appoints a new cabinet with economist Kikis Kazamias from his AKEL as finance minister. The previous cabinet resigned after the power shortages prompted the departure from the coalition government of the centre-right party DIKO. 2011 September - Cyprus begins exploratory drilling for oil and gas, prompting a diplomatic row with Turkey, which responds by sending an oil vessel to waters off northern Cyprus.